The Sword in the Stone (1963) was re-released on June 17 in a new edition. since it’s often hard to find movies they both will enjoy. 5. Lesson of the film: You should think before asking a wizard to turn you into a squirrel, because there are always problems no matter who you are. 6. Did the mother of the main character die in the first scene? Yes, she dies before the movie started. My four-year-old son says his favorite part was the preview for Wall-e, the new Pixar movie. 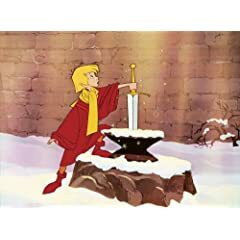 If you already have the previous Gold release (2001) of The Sword in the Stone, this release doesn’t have too much that is new, though it does have a widescreen version. GreatDad Contest: We have three copies of this new release to give away. 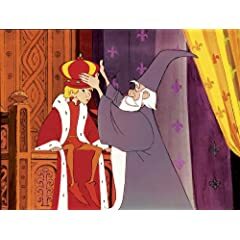 All you have to do is name the major network show from the 60’s that featured the actor Sebastian Cabot (Sir Ector, the narrator, in The Sword in the Stone) as Mr. French. In the case of multiple entries, we’ll draw three winners from the correct responses on July 4th. Contest Update: To see the winners of this contest, click here.